The new collection of works, Awestruck, by Julie Oakes was inspired by her relocation to the interior of British Columbia from her former cosmopolitan surroundings (Toronto and New York). 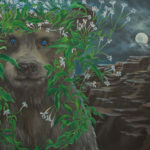 This immersion has allowed the artist to commune with nature and reconnect with primal themes of the land, animals and the elements. 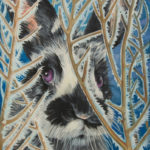 Added to her new natural surroundings, the themes underlying Awestruck stem from the fact that Oakes will soon be a grandmother, the pending birth of her grandchild causing her to reflect of cycles of life, death and regeneration. 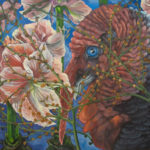 Awestruck is couched in formats and techniques informed by Rocco, classicism and art nouveau such as overblown and detailed representations of flora and fauna. 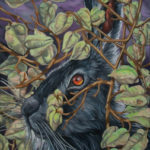 In Awestruck, Julie Oakes continues to explore themes of the spirituality found in nature through the anthropomorphizing of her animal subjects. The subjects seem awestruck by the attention paid to them, which engenders a self-consciousness in their demeanour. 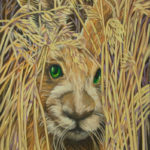 In each portrait, the animal subjects are supported by carefully staged scenes, the foliage and environment of the settings adding to metaphors of mortality. 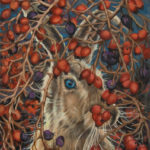 Borrowing from vanitas traditions of historical painting, the animals are given the reverence of saints- their fur perfect and eyes bejewelled- they seem to reflect an ideal of nature rather than the real, messy and unpredictable “otherness” of the animal kingdom.